This week I’d like to share some information about the fascinating phenomenon of blindsight, along with links to other articles on this subject. People can become blind as the result of damage to the retina, but in rarer cases blindness can occur when both sides of the visual cortex are damaged. The latter situation can lead to the strange phenomenon known as blindsight or unconscious vision, in which people believe that they can’t see anything, but can nevertheless correctly identify the positions of objects in space. If you ask these people where a certain object or point of light is, they will say they don’t know, but if you insist and ask them to take a chance, guess, and point in the direction where they think the object or light might be, most of the time, they’ll point in the right direction. Dutch neuroscientist Beatrice de Gelder has shown that such individuals can even avoid objects in their path as they walk down a hallway. In other experiments, researchers have used transcranial magnetic simulation to temporarily blind people with normal sight by disrupting the electrical activity of their occipital cortex. In these cases too, the researchers found, the subjects still had some residual blindsight. [translation] When the subjects tell us that they see nothing, we ask them to put what they can’t see into words—for example, “What kind of nothing? A red nothing? A blue nothing?” More often than not, they answer correctly. And as we continue to train them, to stimulate and even overstimulate their blindsight and make them name these objects that they can’t see, these patients recover their conscious vision. Blindsight can also tell us things about emotions, and in particular whether they are perceived consciously or not. 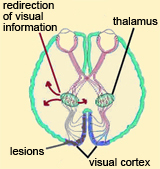 When patients with blindness due to brain lesions are shown pictures of faces expressing various emotions, such as joy, fear, or anger, even though these patients will say that they can’t see anything, they will have physiological reactions (such as dilation of the pupils, perspiration, and changes in heart rate) which reveal that unconsciously, they are perceiving the emotional content of these pictures correctly. And when these subjects’ facial muscles are monitored, it turns out that if a picture shows a joyful expression, the muscles involved in smiling will start to contract, but if it shows a fearful expression, the muscles involved in frowning will do so, which suggests that the subjects somehow understand what kind of emotion is depicted. Also, when asked what they see, these individuals answer “nothing”, but when asked whether, if this picture showed an emotion, it would be joy or fear, they usually answer correctly. Taken as a whole, these findings suggest that even in those of us with normal vision, part of that vision, and part of our emotional responses to the things we see every day, is unconscious, and that we probably perceive many of the features of the world around us—simple shapes, volumes, certain movements, certain colours, emotions expressed by subtle facial expressions —without even realizing it. So just which parts of the brain provide this ability to see and to respond to things that we don’t know that we have seen? Basically, subcortical structures such as the superior colliculus or the pulvinar, which send projections directly to various parts of the visual cortex without passing through the primary visual cortex (V1). 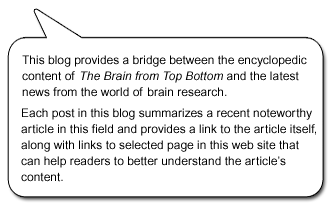 For some nice diagrams of the pathways involved, follow the third link below, to an article published in the journal Nature Reviews Neuroscience in September 2010.